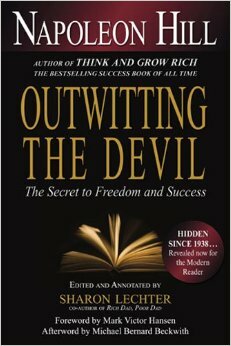 Outwitting the Devil is a book that was written by Napoleon Hill and annotated by Sharon Lechter. It was originally written in 1938 by Hill, but was said[who?] to be too controversial to be published during that time period. It was released by Sterling Publishing in June, 2011. I was expecting a piece of art from Hill’s and he delivered it with the same courage and enlightenment that encrypted in his first work. The book was adorned with great inspirational accolades, and tools that could help a person succeed in life. The book that I read was a shortened version, and also annotated by Sharon Lechter called: Outwitting the Devil: the Secret to Freedom and Success. Her annotation helped tie in the knot between Hill’s period of time and the contemporary world. It was helpful, but some parts were unnecessary. Hill’s previous book Think And Grow Rich revolve around the idea of great ideas and having courage to look forward. This book, however, was the underlying foundation to be build towards the concepts introduced in Think and Grow Rich, because the story was about overcoming your self-doubt, laziness, and procrastination. Hill’s borrowed the “Devil” for these contempt thoughts. In general, this is not your typical self help book because the book is actually a fictional interview transcript between Hill and “the Devil” which turns put to be himself or his wife. The book attempt to bring out two side of the human minds, one represent greatness, which throughout the book, Hill use “God” as a metaphor. The other side of the spectrum was the Devil or your “drifting’ mind or “Your Majesty”. This is a great piece of literature that sure to impress even if you are not an avid reader or not a fan of the self help genre or Napoleon Hill like myself. Even though Hill’s works is great, and I do read most of his works, Some if his view where archaic and had not taken to account many modern attributes, which I do not blame. Outwitting the Devil, however, describe issues with a psychological and story-driven approach so even though the book was written in 1931, there are still many relatable concepts. I am not going to describe in detail the principles and the procedure and antidote, because it is very exhilarating and to experience the full extent of that, you must read it. These principles will be the guiding torch for outwitting the devil and finally take over control of your psychology. This extensive segment will give you such a motivation that you could become a “non-drifters” as Hill’s describe to be one of the greats. The key idea surrounding the 7 principles were the ability to master your mind and emotion to become a fully productive individual, and beat the Devil’s at his own game. The solution was described by the Devil him self, although it was clearly Hill’s word, this continuous borrowed concept of the Devil added another level of thought in the readers’ minds. After finishing the book, the reader can expect a great surge of motivation, as expected from Hill’s work. the book was banned because of the criticisms towards the educational system and the religion. Even parents, and political system was criticize in the manuscript. Hiding this book from the public was a good move because this will cause some controversies, especially when people were not in the right minds among the war and economic breakdown at the time. Overall, this is a great read, and Hill’s have not failed to delivered in this book. The combination of a compelling fictional showdown with the devil, and the tie in with the mind elevated the book to great extent. A great self-help book that could sure to motivate you to do great things, and stop procrastinating, which we all need to stop doing. (Binge-watch Tv shows, Facebooking, surfing Youtube, etc.). This will help you to lowered and even stop your procrastination, and combining this book with Think and Grow Rich you will sure to have a powerful mind. Outwitting the Devil, however, fell a little bit short because I felt like Hill’s could have dug more out of the Devil’s or “himself”.